Speaking of poetic, the New Yorker’s Rebecca Mead considered the favorite words of some writers (mostly British and Irish)—Hilary Mantel loves nesh, Taiye Selasi celebrates the Ghanaian colloquialism chale—and added a favorite of her own. Dot tip, circle break, trixelate, chroma coaster and more: Logo Lounge’s 2015 logo-trends report. Memo to Designbook, Teachbook, and other bookish types: Facebook’s lawyers would like to have a word with you. 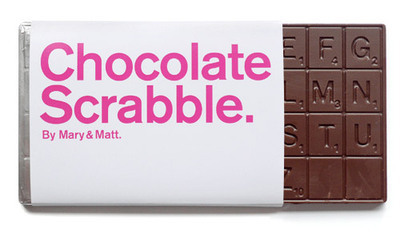 Pwn, lotsa, cakehole, and obvs are all playable Scrabble words now—outside North America, anyway. (The new list comes from Collins Dictionary, which isn’t an official reference in the US.) Here’s NPR on the announcement (and readers, predictably predicting “the death of English”). And here are two views from Lingua Franca, the language blog of the Chronicle of Higher Education: Anne Curzan on how the additions are “in the spirit of the game,” and Geoffrey Pullum with some extremely nerdy math that proves that adding new words won’t make the game easier to play. How Venmo, Zillow, Foursquare, and other technology brands got their names. Dasani, IKEA, and other brand names that became baby names. “A good name...tells a story, whether or not that’s apparent to anyone but the founder.” An unusually good article about name development from Crain’s New York Business (with a misleading title). Syzygy: In astronomy, a straight-line configuration of three celestial bodies in a gravitational system – e.g., the Sun, the Moon, and the Earth. When the event occurs during lunar perigee (the point during its orbit when the moon is closest to Earth), it’s sometimes erroneously called a “supermoon.” Syzygy comes from Greek syzygein, “to yoke together,” via Latin; it’s pronounced SIZZ-ih-gee. In fact, this “supermoon” idea was started by an astrologer named Richard Nolle. On his website, he defines the term as a new or full Moon when the Moon is closer to Earth than usual. He goes and gives a more precise definition, but it’s rather arbitrary*. He says quite bluntly — and quite incorrectly — that lots of seismic events (plus bad weather) can be attributed to the Moon. Syzygy is a legitimate and potentially high-scoring Scrabble word. Syzygy is also the name of another word game played with letter tiles (but no board). 1 Plait's column has since moved to Slate.com, where he published a column on Sunday about this year’s syzygy. Thanks to commenter Steve Hall for the update. If you’re interested in English-language slang from the early 19th century—and who wouldn’t be?—you’ll want to follow @Vulgar_Tongue, which tweets citations from Francis Grose’s 1811 Dictionary in the Vulgar Tongue. A few examples: scandal broth (tea), sir reverence (a turd), and sea lawyer (a shark). The entire book is available online, courtesy of Project Gutenberg. Cartoonist Brian McFadden totally nails the naming style of social-media startups in his Sunday New York Times strip. “Slackify”? Perfect. Past naming trends—remember all those “tronics”?—hold clues to the future of naming. Alan Brew, a principal at brand strategy firm RiechesBaird, makes the case. “Stop talking about names, start talking about characteristics of names”: good advice from Nancy’s Baby Names that works for the company- or product-naming process too. What makes a movie quote memorable? A team of Cornell University computer scientists compared short, memorable lines from about 1,000 movies and compared them to other lines spoken by the same characters in the same films. Read about their findings at Technology Review (I love the title of their paper: “You Had Me at Hello: How Phrasing Affects Memorability”), then take the test yourself. What’s the connection between hood, hoodlum, and hoodie? Jan Freeman of Throw Grammar from the Train investigates. The hidden messages in 28 famous and not-so-famous logos. “The name of these cookies was changed from Blueberry Craze to the more prosaic Blueberry Cookie, so the sweets were less appealing to children.” A naming lesson from a marijuana bakery, via The Hairpin. Mike Pope is conflicted about typos. Or spelling errors. Or whatever you want to call them. URGENT REQUEST FROM MOOR OF VENICE and other Shakespearean spam from comedy writer Megan Amram, who(m) you should follow on Twitter, too. She had me at Bravest Avatar Ever. “When copywriter Robert Pirosh landed in Hollywood in 1934, eager to become a screenwriter, he wrote and sent the following letter to all the directors, producers, and studio executives he could think of.” It begins “I like words,” and it’s delicious. From Lists of Note. P.S. : Pirosh went on to win a screenwriting Oscar in 1949. Fifteen minutes of literary bliss: former US Poet Laureate Billy Collins talks about the collaboration that turned some of his poems into short animated films. One of the best TED Talks I’ve seen. Short month; short attention span. Anatoly Liberman explores the enigmatic etymology of akimbo at the OUP blog. Italian? Gaelic? Icelandic? Middle English? Liberman: "[W]e are still not quite sure where akimbo came from, but 'origin unknown' would be an unnecessarily harsh verdict." You know about those atheist ads on buses in the UK, right? ("There's probably no God. Now stop worrying and get on with your life. "*) Now you can generate your own bus slogan. Beancounters shows us how it's done. And Christa Allan alerts us to the lookalike poster (real? generated?) in an English bus stop: "There's probably no bus. So don't just stand here, start walking." Speaking of sports, it's time for—cue flourish of trumpets—the Name of the Year tournament, the annual companion to March Madness. Early contenders include Harvard fencer Moonlit Wang, LSU football recruits Barkevious Mingo and Shavodrick Beaver, and CNN reporter Casanova Love. Get that office pool going! And as long as we're in the mid-seventeenth, I saw this T-shirt on a guy standing behind me in a movie line, and I almost fell over laughing. Thanks, anonymous movie-line guy! Oh, and if you don't get the joke, read this. * They call it atheist. I say the "probably" makes it agnostic. Scrabble is both mindless and cerebral, which may account for its appeal to writers—it gives you a chance to push words around without having to make them mean something. Three-quarters of that paragraph is quintessential New Yorker: the scholarly use of statistics, the arcane vocabulary ("confraternity"), the long list, the lavish use of commas and semicolons. (In his marvelous book The Sound on the Page: Style and Voice in Writing, Ben Yagoda quotes E.B. White, who said the New Yorker was the publication in which "commas ... fall with the precision of knives in a circus act, outlining the victim.") Then, in the final two sentences, Thurman winks, cracks her knuckles, and talks dirty. Bingo. Fifty things you may not know about President-elect Barack Obama. I'd like to take this opportunity to say how pleased and proud I am that our 44th president is a Scrabble-American. I discovered adnoun while using the Hint function in computer Scrabble. None dare call it cheating! Wise in "The wise talk because they have something to say" is NOT a noun; it's an adjective, in a NP (the wise) that has no overt noun head. This NP is an instance of an odd construction in English that licenses the + Adj as an NP with generic reference — most commonly as a generic plural referring to human beings, so that it can be roughly glossed as 'Adj people'. Other examples: the soap opera "The Bold and the Beautiful", the Robin Hood slogan "steal from the rich and give to the poor", and a headline from yesterday's New York Times (p. 1): The Decided Go In Droves To Vote Early. Bingo wings is a slang term used to describe the build-up of fat and or flaccid muscle that hangs from the underside of the upper arms. It occurs most frequently in elderly ladies and overweight people. The problem may also occur after significant weight loss, with flaps of loose skin remaining. The term apparently originated from the bingo hall custom of raising one's arm aloft and bellowing "House!". This ties in due to bingo long being the entertainment of choice for large numbers of elderly ladies, especially in the United Kingdom. I'm picturing multiple gridded cards, randomly selected balls, a caller ("B-54! G-16! "), and an array of lucky fetish objects lined up in front of each player's playing area. This looks scarily like the inscrutable Sudoku to me, so I'm just going to tiptoe away. There's also a card game called bingo. News to me, but my card-playing expertise reached its peak with Go Fish. Back to the wings. It's not as though I've never seen the phenomenon or heard it described--just not in this very evocative way. I've heard "underarm flaps," which is accurate if a bit pedestrian. And I've heard "bat wings," which sounds so much uglier and less jovial than "bingo wings." Besides, "bingo wings" has that charming little internal rhyme that makes the condition seem almost cute. Not to a plastic surgeon, though. If you're unhappy with your bingo wings, you may want to consult someone like this for a "procedure"--a brachioplasty, to use the term of art. Hey, he'll probably do a FUPA-plasty, too. * "Bingo" is also a term in Scrabble: it's a play in which all seven tiles are used, earning the player a bonus of 50 points. I never knew this until I started playing computer Scrabble. But oh, woe, it's out of stock.